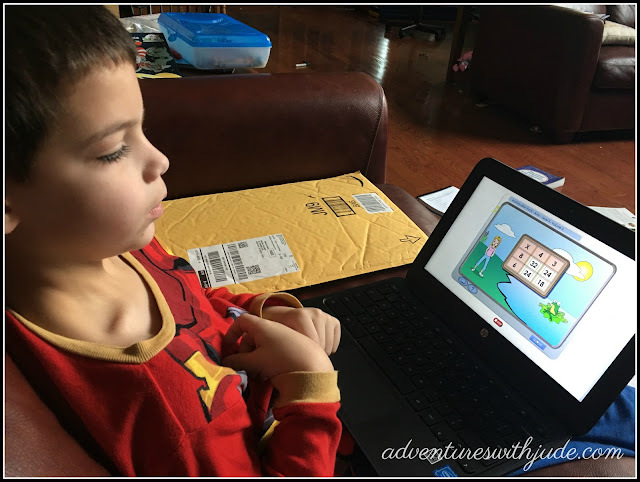 K5 Learning is an online program that gives both homeschooled and "regular school" students an opportunity to practice their reading, math, and spelling skills. A month-to-month membership option makes it perfect for summer practice, or an annual option allows for year-round supplementation. Up to 4 students can be included in a single account. A placement test helps you figure out your child's strength and weaknesses, and the program then adapts itself to your child's needs. We used this program several years ago, and it didn't fit our family very well. 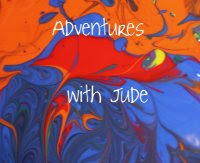 Now that both boys are in very different places than they were at before, we decided to give it another try. I was particularly interested to see how the boys scored. Knowing how they struggled with K5 Learning in the past, and then seeing them repeat a very similar assessment exam, I was really impressed with their current scoring. Jude absolutely blew me away with how well he did. 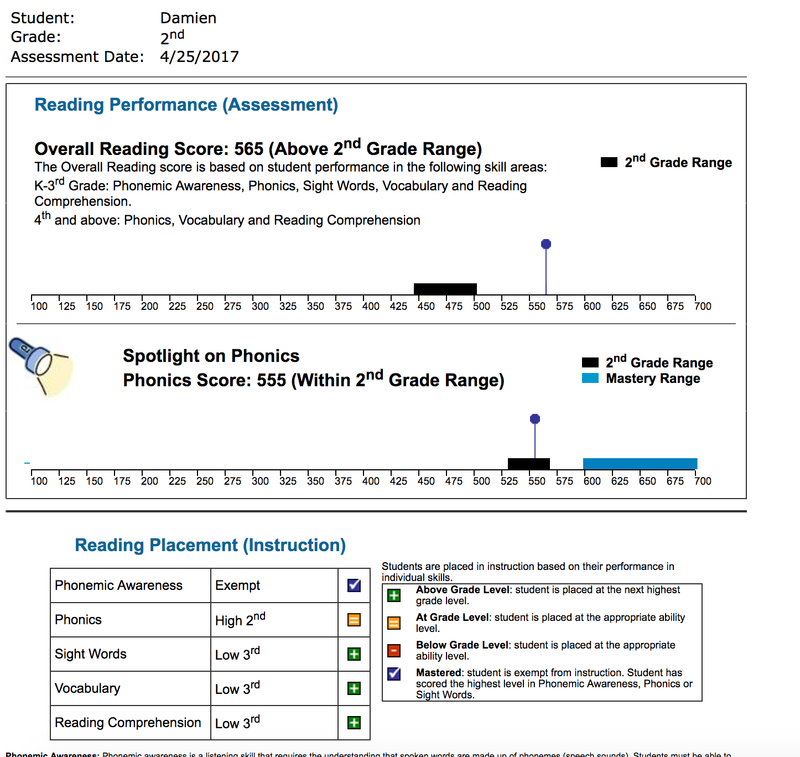 For a kid who has fought tooth and nail for every single academic gain, to be heading into fifth grade and have skills so far above what was expected was a huge confidence boost! Damien also surprised me. He is a kid who seems to learn by osmosis, so this was really helpful to me to see what he was capable of. I like how different skills are separated out into levels. This tells me what each boy's particular strengths and weaknesses are. 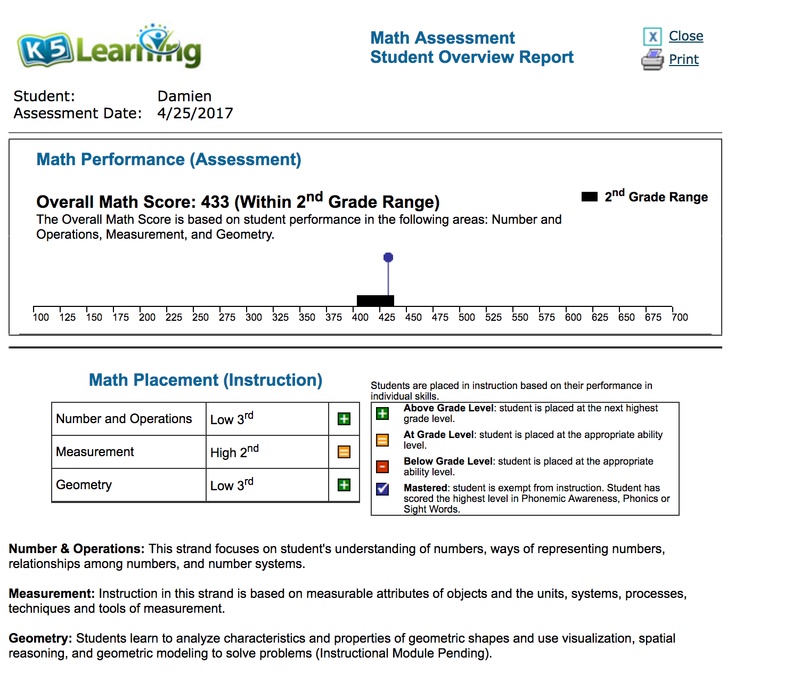 I wish there was something on the K5 site that explained what the score was based on -- is it the parameters of their test? Is it against a standardized norm? With so much educational/therapy/etc. 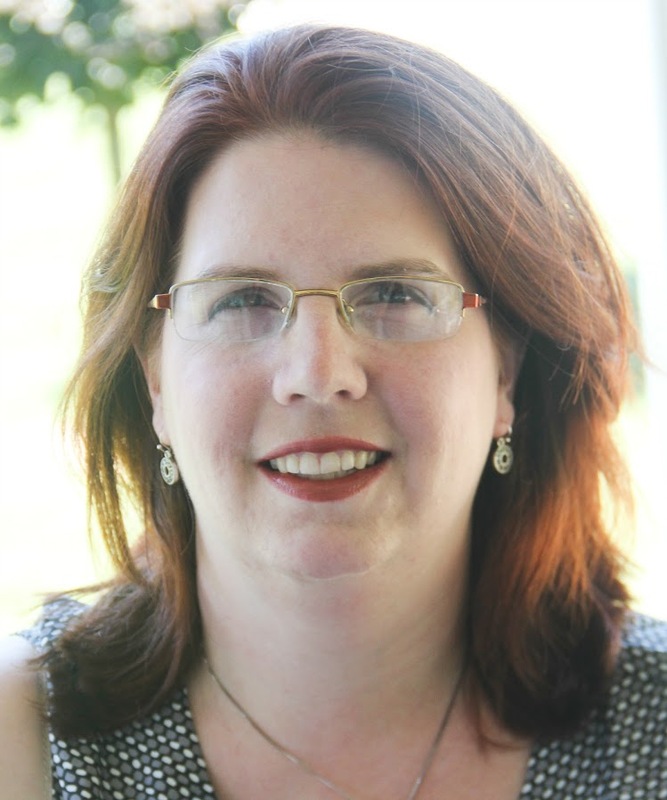 evaluations that the boys have had with their ASD/ADHD/etc., I've become a parent who can appreciate the individual progress but likes to know how the test is graded. This test helps me see how Jude is doing in this program, but you can see that he's very close to maxing out on the program. Since I don't know what it's scoring against, I'm not sure what to look for for the "next step." Jude actually did complete the standard program - or at least I think he did. 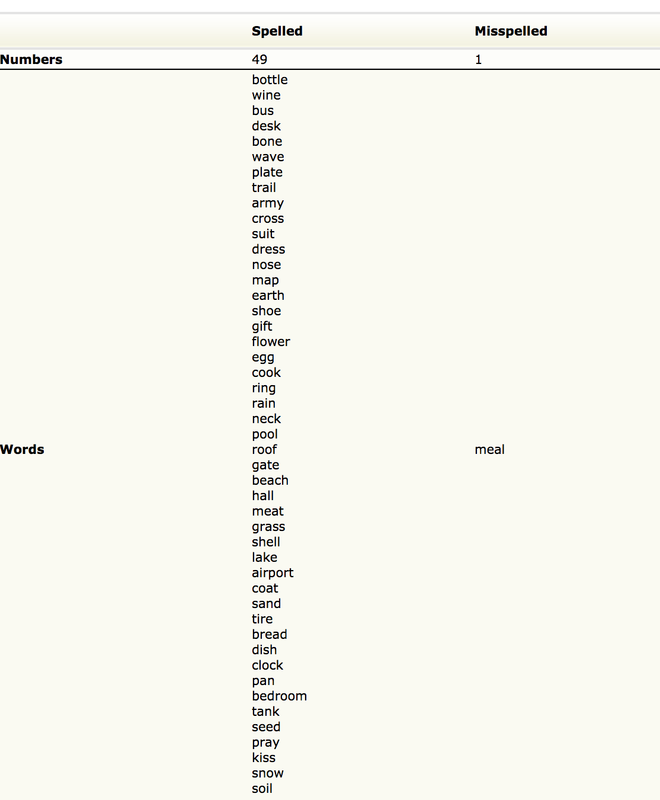 One day he logged in and said, "Um...the reading part is gone!" I didn't see anything anywhere that he had finished, either in the student account or the parent area. There just wasn't anything for him to do. 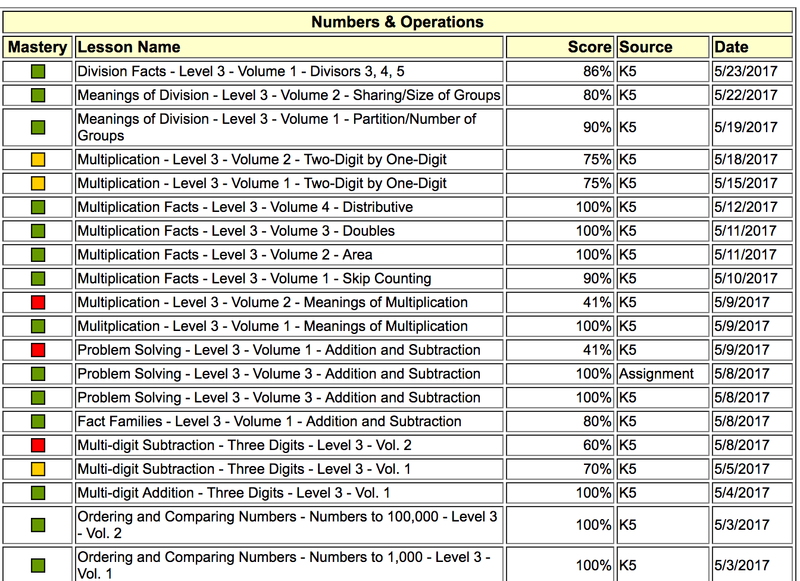 However, while K5 Learning offers an "automatic" program, parents can also assign individual sections to work on. I was able to go in and look for areas that Jude wasn't as strong with and have him try them again. I do like that it shows the date each attempt is created, rather than overwriting the prior attempts, so I can see his progress and see if he is doing better with another chance. That often helps me figure out if he really doesn't understand, or if he missed things because he just was having a not-focusing-well day. If he was consistently scoring low, I could either assign lower level tasks or request that he be brought back down a level to work on more foundational skills. Here, you can see that while I did assign some "try again" tasks, I also assigned Jude some tasks that were officially Level 2 and 3. 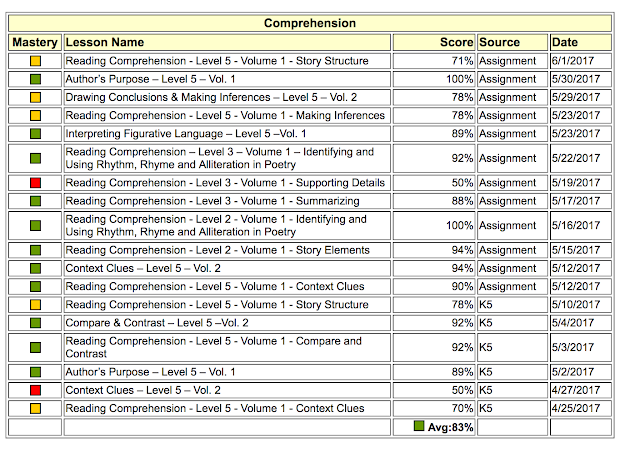 These were "below his grade level" but are literary terms that he has missed because of his uneven learning. 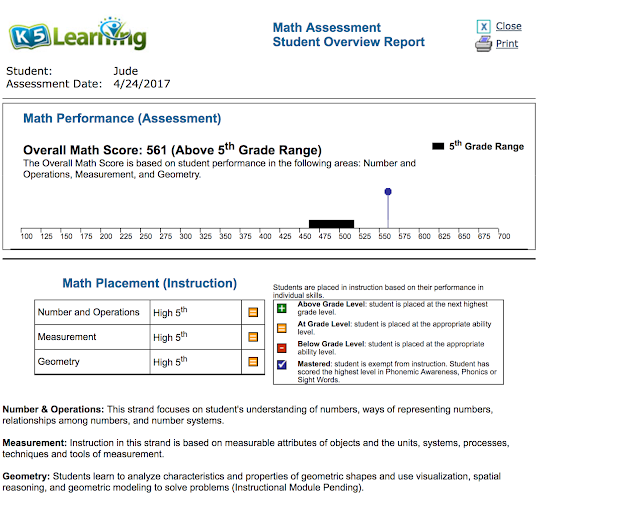 I didn't worry about the overall average because it factors in both the first try and the re-do; rather I looked at each lesson individually to determine the degree of mastery. Conversely, if a parent feels things are generally too easy, you can either assign harder tasks or move the child up. 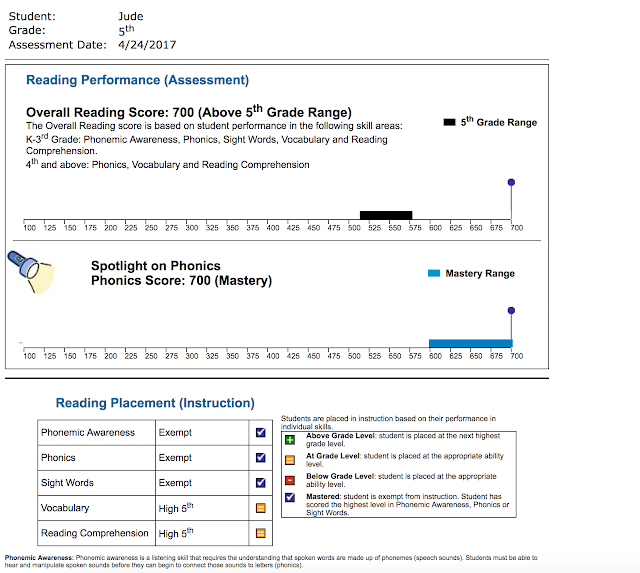 The program will only allow a student to be automatically placed one year above the level the parent indicates he's in, so as not to overwhelm him, but K5 Learning will move a child up a level upon request. I was a little less concerned about how the boys did with Math. Because this is a supplemental program, there isn't a lot of instruction. While there are sections where it might explain a mistake and remind a student how to do a problem (or I was able to sit with Jude and explain the literary terms that he needed to learn), it assumes that the student generally has a basic understanding of what is being presented. 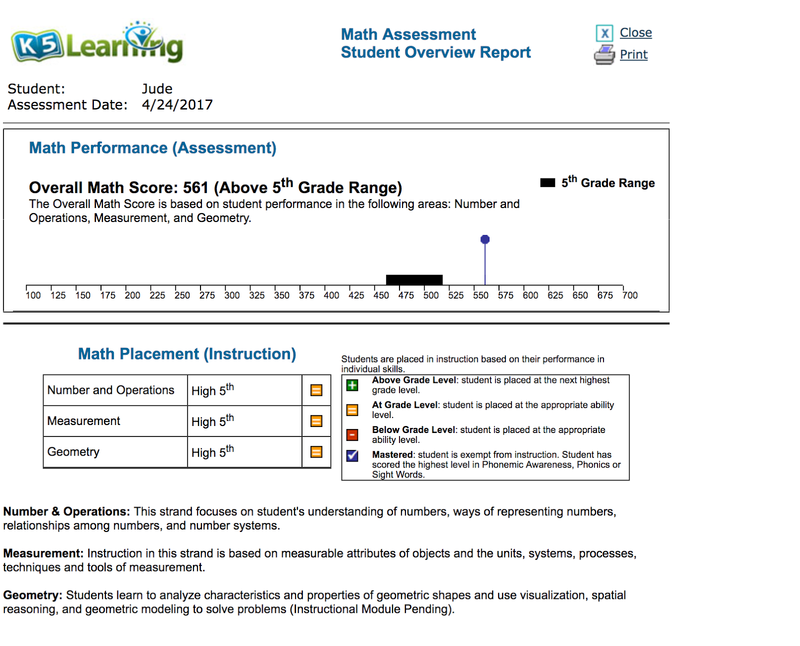 Because the boys use a math program that is topic (rather than grade) based, there were some things that a typical student at their grade levels would be exposed to but they hadn't been yet. I told them to just give it a shot, and I wasn't worried if it was right or wrong. To my surprise, Damien has taught himself multiplication (he started with skip counting, and after enough times had memorized, for example, how many groups of 6 it took to get to a product. For a kid who hasn't done any multiplying, I'm impressed at how well he's worked with it! In addition to Reading and Math, K5 Learning offers a spelling program. Jude chose not to work with it, but it became Damien's favorite way to procrastinate putting away his computer and moving onto other activities. K5 is fooling around with these words -- there are some toughies in the group! K5 Learning's Spelling program has a built-in word database, but a parent can also tailor the program with specific words that the student needs help with or adjust the number of words in a session. In addition to practicing spelling, it also introduces a vocabulary component with definitions and sentence use. Overall, I'm much more impressed with this program this time than I was last. Before, I felt that the grade levels were a bit inflated. This time, I think the program looks at a wider variety of components that helps really tailor the program to an individual. I like the flexibility to either let the program progress automatically or to tailor specific tasks to what a child needs. While I think that there are some places for the program to improve (opt-out answers in the placement test, clearer "You've reached the end of the program" notifications), K5 Learning is something that I would now recommend to use for students in the early elementary grades. 83 Crew families have been practicing their skills with K5 Learning. Click the banner to read their reviews!